Apple yesterday announced financial results for its fiscal 2012 first quarter, which spanned 14 weeks and ended December 31, 2011. The Company posted record quarterly revenue of $46.33 billion and record quarterly net profit of $13.06 billion, or $13.87 per diluted share. These results compare to revenue of $26.74 billion and net quarterly profit of $6 billion, or $6.43 per diluted share, in the year-ago quarter. Gross margin was 44.7 percent compared to 38.5 percent in the year-ago quarter. International sales accounted for 58 percent of the quarter’s revenue. It’s really impressive to see that the iPad enjoyed a record quarter, with 11.12 million tablets sold. That’s a 166 percent jump over the 4.1 million iPads Apple sold during last year’s fourth quarter. I tend to agree with the fact that “it’s pretty clear that if you forecast out in time, the tablet market will be larger than the Mac/PC market” as stated by Tim Cook and reflected by us last year in a data monetization project executed for a mobile operator in Europe (see iPhone and iPad adoption rate exhibit bellow). What’s clear to me is not the negative potential cannibalization effect that this will have on the PC/Mac industry but the positive data revenue enhancement effect that will have on the telecom business. Mobile operators will be among the biggest beneficiaries of the Apple iPhone and iPad’s success, thanks to the devices’ use of mobile data services to access applications and digital content. But, is this real good news for the telecom players? First (negative impact): the capacity issue. Again. As long as telecom operators’ networks are up for the task of delivering the coming tsunami of Megabytes forecasted (please check our posts about this here and here) a high uptake of iPhones/iPads could only be good news for them. The problem comes when the operators need additional capacity to extend their data portfolio and when a trade-off between capacity congestion and data CapEx reveal an insufficient business case. Second (positive impact): the multi-data sim effect on data Arpu. The concept “one customer – multiple data sims” is slowly being adopted by different customer segments across operator’s customers base, and is increasing quarter after quarter. 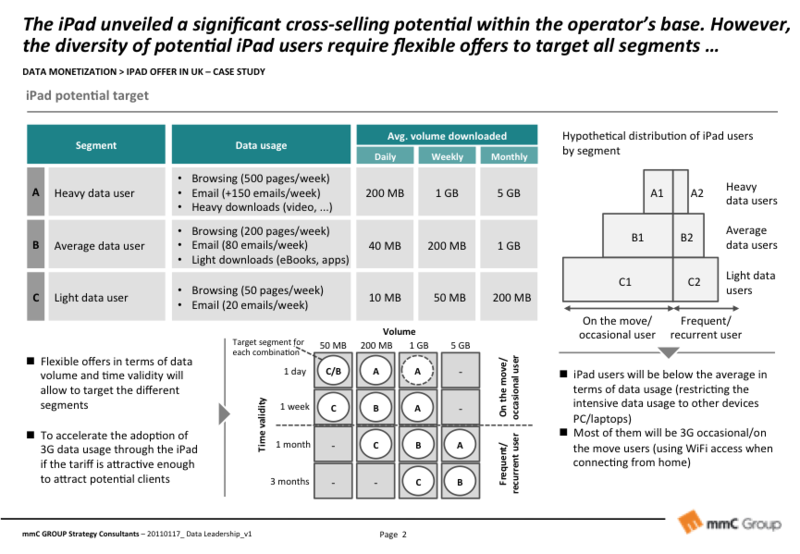 The old multi-sim effect that used to have a negative effect on voice Arpu is evolving into a positive effect when referred to data, as operators are seeing a quick acceleration of the adoption of 3G/LTE data usage thanks to a wide range of connected devices, out of which, the iPad has a privileged position. IPads will drive demand for data access, and the iPad along with an existing telecom contract will provide a compelling new opportunity for mobile operators to increase data subscriptions on existing customers, and hence bellow-the-line revenues. Third (positive impact): Revenues from digital content still remain as a small share of mobile operators’ revenues. The real challenge of digital media for telcos relies on how to provide better access to content whilst leveraging its core assets (billing relationship, marketing power, access to customer data, trusted brand, etc.). Once iPads have well established as a device category, the main barrier consists on engaging with developers and publishers to use the operator’s network to deliver the attractive new opportunity for software and content production that devices such as the iPad bring. Fourth (negative impact): Apple’s devices procurement cost will maintain their premium over rest of the brands. As happened in the past decade with the market leader handset vendor, (when Nokia asked the operators for a premium handset procurement cost for every single model they launched based on the thought that a Nokia user had higher voice ARPUs), Apple is asking the operators for a relevant price premium for its devices. The “you take it or leave it” procurement approach has a negative effect on operators as they are obliged to pay higher procurement costs and increase their SAC an/or SRC levels, with the promise of a future higher data ARPU (that in some cases never comes). Once Apple and Google are fighting to build the dominant mobile platform for the next decade (or longer) a telecom operator can’t simply afford to say “no” to Apple, reason why the accept this premium. 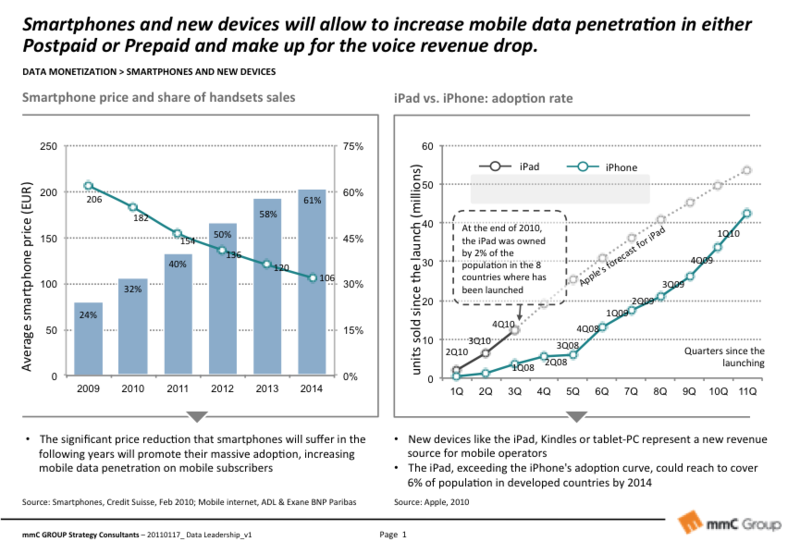 So, will Apple’s success benefit mobile operators? Who knows? Apparently yes but I recurrently start to hear “mobile operators are no longer my competitors. My new competitor is Apple (or Google, Facebook and the likes)”. I will leave it to the reader to sort out whether it’s too soon to think like this or not. Let us know what you think by commenting below. Enjoy the reading, CVA.